I shall provide a bit more background and commentary as the design concept develops here in my blog, where there are no space or format constraints, but the official "home" of my design concept will remain on Thingiverse. Note: This design concept is a "work in progress", and I fully expect the designs to evolve in response to my own testing, and the comments of other RepRappers. This project came about partly because I am an engineer, and I “need to know” these sorts of things, but was also spurred on by reading an paper on “3-D Printing of Open Source Appropriate Technologies for Self-Directed Sustainable Development” by Pearce, Blair, Laciak, Andrews, Nosrat & Zelenika-Zovko. Full testing of the present abilities of open source 3-D printed parts is needed, including testing a structural part to failure to determine general properties; and analysis/development of necessary testing equipment which could be available to open source 3-D printer users in the field, in order to contribute numerically to the knowledge base on printed OSAT. This can be accomplished by printing a series of beams of different materials, testing them and reporting the results to the open source community. This project presents my suggestions towards the development of a standard testing program for 3D printing (and other RP technologies). a) Two short lengths of 8 mm steel rod (as used as the machine axis slides), which act as the test piece support pins, ensuing the test pieces act as simple beams of constant span, with minimal influence of other loading paths. b) Weights or similar to load the test pieces. These could be readily available standard cast metal weights, if available, or else any convenient masses which must be weighed prior to testing. The test weights are placed on the load pad on the top face of the test piece, ensuring the load is applied as a Point Load at mid-span. c) A means of measuring the deflection between the underside of the test piece and the Deflection Measuring Pad on the top face of the Test Bed – e.g. a dial gauge or digital calliper. The Deflection Measuring Pad ensures deflection measurements are taken reliably at mid-span of the test piece. c) “Vertical Alignment” – such that the test price is printed standing “on end” – this will b a much more “savage” test of the strength between layers, as the tensile beams stresses will act directly on the layers. I have presented two sample test price geometries; one is a simple rectangular beam, which will allow testing of geometrically identical samples with different % solids core fill. The second is a modified I-Beam which would be a more “savage” test of the strength of components with complex geometry and thin walls, but which should be less sensitive to the % solid fill used (being largely “thin wall” construction). The I-Beam has stiffeners applied at the load concentrations so that its failure will tend to be governed by overall beam failure mode, rather than local crippling of the load points, etc. Both Test Piece profiles should be able to be fabricated on most 3D Printers in any orientation without the requirement for support (assuming the machine is capable of achieving reasonable “bridging”). The design concept allows for an infinite range of test piece geometry and orientation, but to be generally useful, standardised testing regimes should be developed. n Print one (or more) Test Beds. n Print sufficient identical Test Pieces for the testing program. Keep records of the build and print parameters used (material, used, machine settings, % solid core fill, etc). Weigh the test pieces as a record of overall effective density. Where scales of only limited precision are available, weigh five or more identical pieces in a single weighing to get an effective mean sample weight. n It is suggested that a minimum of three identical test pieces should typically be printed whenever undertaking a formal testing and reporting program, although a single test piece can still yield useful insights into material behaviour when trying to determine a “semi-quantitative” assessment of comparative properties yielded by different printer settings etc. If the set of Test Pieces are printed as a nested suite in a single print run (rather than as a series of sequential print runs), this will ensure all pieces are manufactured under identical conditions, minimising variations due to machine preparation, operator skill, environmental conditions (temperature , humidity, dust), etc. It should be possible to arrange a suite of 5 or even 10 identical test pieces to be produced in a single print run in this way. n Consider printing sets of test pieces in different orientations when it is desired to understand the 3-dimensional orthotropic characteristics of the material. n Repeat for each test piece in a suite, so that statistically meaningful results can be obtained. n Repeat for different manufacturing orientations, so that the influence of orthotropic material properties can be assessed. It is suggested that the RepRap community should review the design concept as presented here, and attempt some individual testing programs. It is possible that the design concept may need to be modified for broad adoption generally; e.g. larger (or smaller) test pieces may be considered appropriate to be generally representative. If successful, it is proposed that a formal test regime and reporting system would be developed and published; e.g. either through the RepRap.org website, or other OSAT Community Host. Individual users would test and report their findings. Results could be searched and filtered so as to provide statistically useful data on the practical material properties that can be achieved with different classes of 3D printers and stock material. This information could be used to allow machine users to “benchmark” their own machines, and also as an aid to design and manufacture of components. 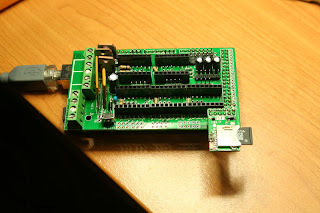 This project was a “work-in-progress” before I became aware of the OSAT initiative, and was intended mainly for my own entertainment / education, but with a view to sharing with the RepRap community. I created these design s using proprietary “Alibre Design” CAD software, Mathcad and Microsoft Excel workbooks, etc. It is proposed that if the concept is deemed to have general applicability, the source files for all parts should be created in Open Source software (e.g. OpenSCAD), and Open Source software should also be used for record keeping and reporting (e.g. Open Office etc). ... it ain't broke, but you still gotta fix it! b) The PLA slide bushes on the X and Y axes were OK, but were prone to a little bit of "slip-stick" friction, which would lead to "shudder" which could be seen in the filament make-up of printed parts. So, I printed and installed some new Z-Axis Couplers http://www.thingiverse.com/thing:9622 to control the Z-Axis wobble. DON'T FALL FOR THE SAME MISTAKE!!!!! Even though the Z Axis is now MUCH smoother, there is still some mis-alignment, and if the motors are held down tightly, you will probably hear all sorts of nasty grinding noises (or worse - and bust a PLA slide bush on the Z-Axis like I did!) Luckily, I had some spare PLA Bushes, so was able to fix this quickly,and immediately removed the Z Axis motor screws again. With the motor again free to flex a bit, the Z axis is now really nice and smooth again. I also bought some LM8UU linear bearings on eBay http://www.ebay.com.au/itm/330621488095?ssPageName=STRK:MEWNX:IT&_trksid=p3984.m1497.l2649 to install on the X and Y axes. I made some LM8UU snap-fit holders http://www.thingiverse.com/thing:7755 out of PLA for the Y axis . (I'm not printing in ABS yet, coz I don't have a heated bed yet, although I have ordered the heat bed.) These came out OK, but are a bit brittle, so some of the snap-fit retainers broke when I was inserting the bearings; however, they are still functional, so I installed them anyway. I will make myself another (hopefully stronger) set when I replace the whole print bed to install the heated bed. I also printed myself a LM8UU X-Carriage http://www.thingiverse.com/thing:13054 out of PLA. This came out very nicely - nice and solid, and no damage when I installed the linear bearings. So ... does it make any difference? In a word: YES! The Z-Axis wobble is almost entirely eliminated, and the X and Y axis movement is very noticeably improved - super-smooth and whisper quiet, and this all translates into really nice prints. I'll post some pictures of my current improved print results shortly. ... The need for speed! I may be getting ahead of myself here, but having done some calibration tests http://julianh72.blogspot.com/2011/11/quality-street.html which have made HUGE improvements on my print quality, I decided to see how fast I can print. I know, I know, I haven't finished calibrating yet, but I guess the "best" 3D printer for me is one that can build parts with "acceptable" quality at the fastest practical speed. I figure it is likely that there will be trade-off between speed and quality, and I just want to know what my options are. Most of my calibration printing was done at 30 mm/ s, and while it is by no means perfect, the quality is "not bad" (if I do say so myself). I decided to have a go at 45 mm/s and 60 mm/s, just to see what happens. For now - I will probably do most of my "quality" prints at 30 mm/s, but it is nice to know I can double the print speed whenever I need a "quick and dirty" print of something in half the time. I have just spent a few hours working through the Calibration procedures and test pieces on the Wiki http://reprap.org/wiki/Calibration - and the results have certainly been worthwhile! It seems my settings weren't a million miles from where they should ideally be (and I'm sure further improvement is possible, and I will keep pursuing improvements), but in the space of an evening's work, the quality of parts that I am now producing has improved markedly. Anyway, the only major "sticking point" was the amount of time our laptop has spent "anchored" to the desk with the RepRap attached by its USB "umbilical cord", when she wanted to take the computer into the living room to use while watching TV, etc. Easily fixed, I figured - just install SD RAMPS http://reprap.org/wiki/Sdramps so I would be able to print while not connected to a computer. I ordered the SD RAMPS module from RepRapWorld http://reprapworld.com/?products_details&products_id=49&cPath=1591_1609 and it arrived a few days later. ... and my printer stopped dead in its tracks, even though it was still hooked up to 12 V power. I repeated this process a couple of times, and was about to give up, when a little bell went off in the back of my brain. Hadn't I read somewhere about an extra diode on the RAMPS board if you wanted to print computer-less? Definitely solder D2 in. D1 should only be installed if the 5A rail is powered by 12V. It can be omitted and the Arduino will be powered from USB. You will want D1 installed if you add components to print without a PC. To reiterate, D1 MUST be omitted if you are powering the 5A rail by more than 12V. Okay - disassemble the RAMPS from the Arduino, solder in a second diode D1 (under the X and Y StepSticks), reassemble, and try again. ... and then it stopped! Repeat this cycle a few times - what is going on? I take the micro SD out of the SD RAMPS and take a close look at the files that are on it. Funny ... the gcode files are awfully small! I try uploading a gcode file from Pronterface, watching progress more closely - it is VERY slow to transfer the data. Maybe I truncated the previous gcode uploads by being too impatient? I wait a few minutes while the upload completes, and try again - and this time, the print runs right through to completion, while my PC is in a different room. When uploading gcode files to the micro SD card, watch upload progress carefully before disconnecting anything - gcode uploads to micro SD via Pronterface are R...E...A...L...L...Y S...L...O...W...!!!!! Alternatively, take the micro SD card out of the SD RAMPS and upload to it direct from your computer's micro SD Port or Adaptor. This will upload typical gcode files in a second or so, and is probably quicker than waiting for Pronterface to manage. Then you can re-insert the micro SD card into the SD RAMPS, and you're good to go. From Pronterface, select the gcode file on the microSD that you want to print, and when the print job is running, you should be able to disconnect the RepRap from your computer (but keep it connected to its own power supply! ), and the print job should continue through to completion without being connected to a computer.